An appreciation by Peter Fischer, historian of mosaic. Renato Signorini, who died in Ravenna on 30th March 1999, was a Grand Old Man of mosaic, probably the very oldest, as he reached the age of ninety on 23rd August last year. As Professor of Mosaic at the local Accademia di Belle Arti for four decades, he was loved and indeed revered by generations of his students from all over the world for his gentle and unassuming manner, and his unsurpassed skill, which he in turn had learned directly from the Old Masters of mosaic of the fifth and sixth centuries whose techniques he studied at first hand when he was in charge of restoration work in the famous churches of Ravenna. It was largely due to Signorini that these early Byzantine techniques were rediscovered and revived, not only for making exact copies of old Ravenna mosaics for sale to tourists and foreign museums, but also for mosaics designed by modern artists such as Gino Severini, who learned much from him. Signorini thus helped to modernize the art of mosaic, although he was too modest to offer mosaics designed by himself. He also practised the very convenient "double reverse" method of setting a mosaic in a temporary bed and covering the surface with layers of gauze so that it can be transported to the site with the carefully varied inclinations of the tesserae intact. 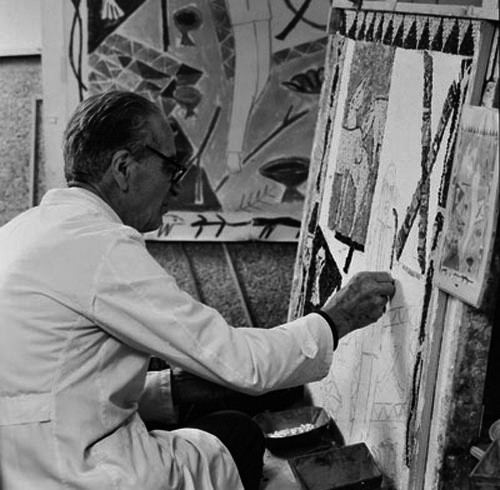 After leaving his teaching post he continued working in the studio run by his son Carlo. From our first meeting in 1965 I remain in this dear friend's debt for introducing me to the fascination of mosaic art and its technical complexities. Although known and admired only by specialists, Renato Signorini must rank as one of the great mosaicists of our century.